Beautiful British Made Tweedmill Textiles recycled blanket/ rug in Mulberry and Green Keith check/tartan. 50% Wool, 40% Acrylic & 10% other fibres. Cold wash and line dry only. Would also make a nice gift. Fuschia, Orange, Black & White Checkered Lap Blanket 45x54. Condition is Pre-owned. Shipped with USPS Priority Mail. Fuschia yarn is stitched around perimeter of the throw. Really soft. Found at goodwill. 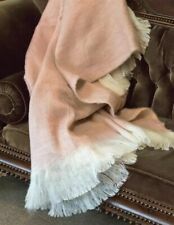 From the Victorian Trading Co Blush Mohair Wool Blend Sweater Throw To surround yourself with a lush warmth, a mohair blanket is bordered with elegant fringe. 50 x 60". 10% wool, 65% acrylic, 25% polyester. Dry clean only. VTC Exclusive! Blush Pink Free Shipping. 53 x 63" plus extra long 5" fringe on all sides. Woven throw blanket in shades of gray, light on one side, darker on the other, with contrasting border. Throw Blanket Mohair and Pure Wool by Donegal Design Purple Teal Green 54 x 60"
Donegal Designs, Ireland. 70% mohair 30% pure new wool. Throw blanket. Plaid pattern. Teal green, light blue and purple. Textured throw made with coloured squares. Chunky knit. Can be used as a throw or blanket. Or as a rug or mat on the floor. Colour: mixture blue, red and purple squares. beach-home. Brand new style for Autumn Winter 2018! Lovely British Made Tweedmill Textiles recycled blanket/ rug in lemon yellow. Ideal for the home, travelling, picnic. Would also make a nice gift. 50% Wool, 40% Acrylic & 10% other fibres. More available. Measures approximately 120cm x 150cm including edging. Other styles also available as seen in the photos. Please feel free to ask any questions. Cold wash and line dry only. Lovely British Made Tweedmill Textiles recycled blanket/ rug in Rusty Orange and grey. Would also make a nice gift. 50% Wool, 40% Acrylic & 10% other fibres. Cold wash and line dry only. Edged in White all Round. Photo One. Would also make a nice gift or a pet blanket. Cold wash and line dry only. beach-home. Beautiful British Made Tweedmill Textiles environmentally friendly recycled blanket/ rug in Orange, turquoise, cream with hints of mustard, navy check/tartan as shown in photo One. Ideal for the home, travelling, picnic. Would also make a nice gift or a pet blanket. More available. Measures approximately 120cm x 150cm including edging. Other styles also available as seen in the photos. Please feel free to ask any questions. Cold wash and line dry only. Lovely British Made Tweedmill Textiles recycled blanket/ rug in Green and grey. Would also make a nice gift. 50% Wool, 40% Acrylic & 10% other fibres. Cold wash and line dry only. B ra nd N ew B ig gi e Be st L ad br ok e Th ro w. Ta ke a l ook a t my o th er it em s. F re e po st ag e in t he U K. Pl ea se a sk a ny q ue st io ns. Hand made crochet blanket. In good condition, yarn is bulky type and since it was preowned May have fuzz but in good conditions! I didn’t see holes or stains! Fully completed quilt! Quilt will be boxed secured so that it arrived safely. SQUARE GRANNY BLANKET. IDEAL FOR MUSIC FESTIVALS. From the Victorian Trading Co Hand knit Sweater Throw Cuddle up with a good book or embark upon a blissful afternoon nap, swaddled in a glorified rendition of your coziest sweater. Sumptuous wool/acrylic blend. 50 x 60". Dry clean. Hand-knit. Imported. Free Shipping . 53" x 72" (not including 7" fringe). Modern design, lovely and fluffy with the softest goatskin fringe. We will provide you the information needed to file your claim for breakage. Any problem can be resolved. One sofa throw blanket from Pottery Barn. Measures: 40” x 60” Wool and cotton blend material with a short fringe in two ends. Heavy embroidery in a paisley scroll pattern. Background color is a natural off white or ivory and embroidery is in shades of brown to beige with some gold. Brand new without tags. Excellent new condition. Knit / Crochet Heavy Wool Throw / Rug Blue Pink 36" x 24"
Lovely British Made Tweedmill Textiles recycled random wool mix stripe large blanket. Would also make a nice gift. 70% Wool 30% polyester. Cold wash and line dry only. This is a handmade Throw or Blanket. It has a unique design and has been knitted entirely by hand. The body of this item is made from cable knitted, "rosebud" coloured Aran yarn, which is 20% wool and 80% acrylic. Kingsize crochet granny blanket 84" x 84" very soft and and heavy. Excellent condition. Very lightly used. Soft and plush. Nice condition. 64x50. From the Victorian Trading Co Red Mohair Wool Blend Sweater Throw To surround yourself with a lush warmth, a mohair blanket is bordered with elegant fringe. 50 x 60". 10% wool, 65% acrylic, 25% polyester. Dry clean only. VTC Exclusive! Cardinal Red. Crochet Rainbow Baby Blanket / Baby Afghan / Crochet Granny Square / Pram Blanket / Stroller Blanket / Baby Afghan - Unisex - For Boy or Girl - 38" x 37". Crocheted in a Chunky Yarn. This lovely Baby Blanket has been hand-crocheted in a beautiful chunky yarn. Moroccan throw, blanket, bedspread sofa cover in gorgeous shades of red, handwoven using wool, cotton andsabra cactus silk. Ideal as a bed, sofa spread or quilt. Can also be used for soft furnishings to give your room a unique and original Moroccan effect. This throw makes a lovely extra blanket and is pictured on a double size bed to give an indication of size. It could also be used as a sofa throw, chair blanket or just a cuddle throw on a cold winter night. beach-home. Lovely British Made Tweedmill Textiles recycled blanket/ rug in Jade Green. Ideal for the home, travelling, picnic. Would also make a nice gift. 50% Wool, 40% Acrylic & 10% other fibres. More available. Measures approximately 120cm x 150cm including edging. Other styles also available as seen in the photos. Please feel free to ask any questions. Cold wash and line dry only. This beautiful handcrafted piece is made using mixed fibre (wool and acrylic) double knit yarns. 9 (3 x 3) red and cream coloured squares are joined within a cream scalloped border. Custom pieces can be created with your preferred colours. Made mid century circa 1970 of mixedwool blend and synthetic fabrics in a patchwork or square pattern. Sourced in France. This would have taken many hours to make. 217cm x 191cm. Classic Brocante is a husband and wife team, Franc and Karen Jackson. Wool 50% Acrylic 50%. cosy addition to sofa or bed, great for bringing colour to the room. Lovely for a sofa or draped over the bed. Structure: 88% wool/12% cotton. Overlock finishing. Made in Lithuania. Throw may have individual variations, because of the nature of the product. We will provide you the information needed to file your claim for breakage. Brown and cream woven Leopard reversible cover/bedspread/blanket/throw bought in Saudi in the eighties. Size 90" by 78" and very thick Light Leopard on Dark brown and Dark Leopard on light cream. The blanket has been knitted with a double knit yarn with a coloured nep to add real texture. It will be a wonderful accessory in the nursery, stroller or car seat and will double up as a comfort blanket to help your baby fall asleep. Hand Knitted Knit LAP BLANKET THROW White & Multi colours Flowers 52" x 52"
Hand Knitted Knit LAP BLANKET THROW. Wool Blend. Minimum stretching of the wool. PACEY 100 THROW. Double face Throw 75% wool, 20% cotton, 5% acrilic fiber, 7% poliammyde.